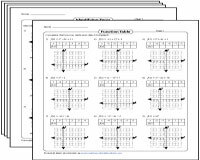 A vast compilation of high-quality worksheets designed by educational experts based on quadratic functions is up for grabs on this page! 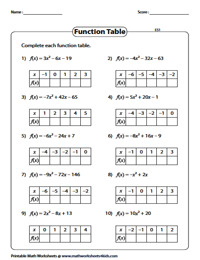 These quadratic function worksheets require Algebra students to evaluate the quadratic functions, write the quadratic function in different form, complete function tables, identify the vertex and intercepts based on formulae, identify the various properties of quadratic function and much more. A number of free printable worksheets are at your disposal. 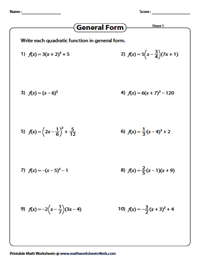 This set of quadratic function worksheets contains exercises on evaluating quadratic functions for the given x-values. The worksheets are classified into two levels. 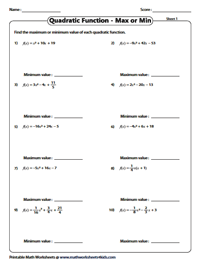 The x-values are integers in the easy level worksheets. In the moderate level, the x-values are decimals or fractions. 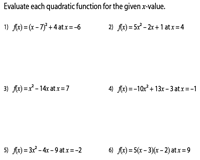 Complete the function table by substituting the values of x in the quadratic function. 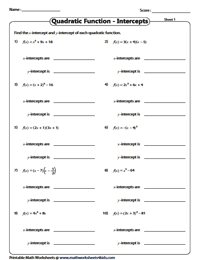 The coefficients and x-values are integers in the easy level worksheets. In the second level, either coefficients or x-values or both are fractions. Write a quadratic function based on the vertex (h, k) and a point (x, y) provided. Use the vertex form f(x) = a(x - h)2 + k to find the quadratic function in this series of worksheets. Based on the zeros and a point given, write the quadratic function in intercept form f(x) = a(x - p)(x - q) where p, q are zeros. Find the value of 'a' by substituting the point and then form the quadratic function. 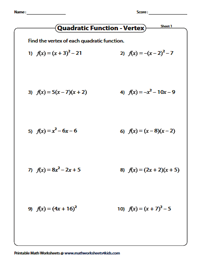 Convert each quadratic function to the general form f(x) = ax2 + bx + c. Check out these exclusive worksheets that contain 10 problems each which provides for ample practice. Use the answer key to verify your responses. Factorize each quadratic function and write the function in intercept form. 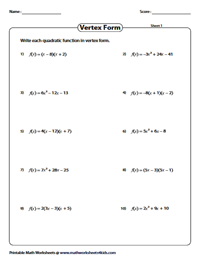 Practice this array of worksheets to gain skills in factoring the function, finding zeros and converting quadratic function to intercept form. 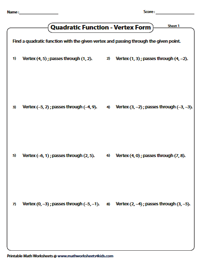 Convert each quadratic function to vertex form, y = a(x - h)2 + k. Download these worksheets and apply 'complete the square method' to write the quadratic function in vertex form. Write a quadratic function in intercept form (factor form) to find the x-intercepts. Set x = 0 to find the y-intercept. 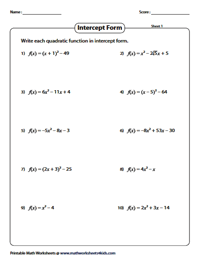 Use these quadratic function worksheets to evaluate students in finding the x-intercept and y-intercept of the given functions. The maximum or minimum value of a quadratic function is obtained by rewriting the given function in vertex form. If the coefficient of x2 is positive, you should find the minimum value. If it is negative, find the maximum value. Review the results and record your answers on the worksheets. 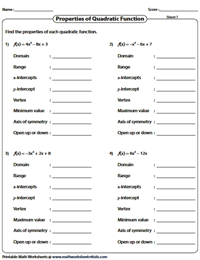 This collection of quadratic function worksheets requires students to find the following properties of quadratic function: domain, range, x-intercepts, y-intercept, vertex, minimum or maximum value, axis of symmetry and open up or down. 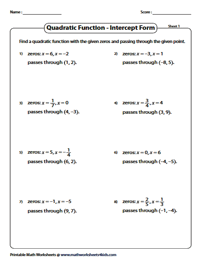 These graphing quadratic function worksheets encompass identifying zeros, graphing quadratic function using function tables, MCQ, properties of graphing quadratic function and more! 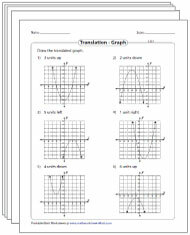 This set of worksheets provides adequate practice on translation and reflection of quadratic function using graphs and vice-versa.